Nardos Imam introduces the art of custom design to clients seeking signature gowns for their most anticipated special occasions. Her sophisticated approach to design has made Nardos a leader in the couture evening wear industry. From one-of-a-kind bridal gowns to couture evening wear to ready-to-wear cocktail attire, Nardos is noted for creating a diverse array of looks that evoke feminine grace and the glamour of times gone by. Nardos launched her own line, Nardos Couture, in 2009. In 2013 she re-launched under her name, Nardos Imam, before introducing the rebranded NARDOS Design label to much acclaim in 2016. In 2017, Nardos launched her first ready-to-wear line, a collection of daywear and cocktail attire that gives women access to couture looks at a more affordable price point. In every endeavor, Nardos seeks to create styles that reflect the beauty and grace of the women who wear them. Nardos believes that her inspiration comes from above. She draws strength from her faith in the Lord, her family, and her community. Her love of print and color are reflected in each of her designs, and her passion for couture is reflected in every stitch she sews. 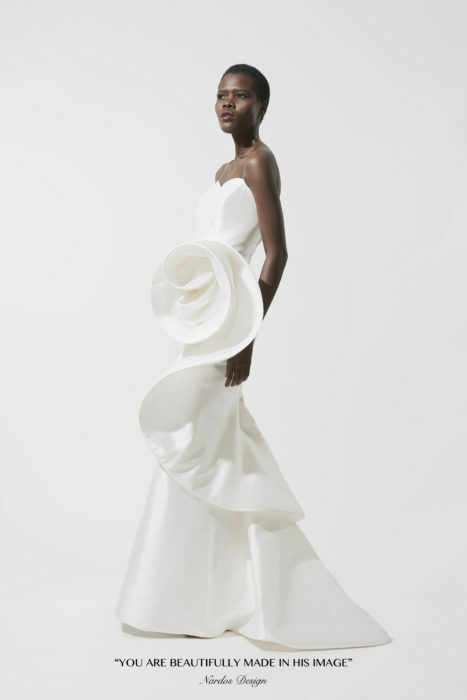 We are honored to create gowns that are worn during some of life’s most significant occasions, of which weddings are at the very top of the list. It is our joy to turn a bride’s long-held dreams about her wedding gown into a custom, timeless garment worthy of her walk down the aisle. At NARDOS Design, the creation of a custom garment is a true collaboration between client and designer. We specialize in true custom couture: designed specifically for you and made to fit you.